Twitter user Kissi (@kiss_kissi) perfectly described the Women’s Post-Conference Championships Watch List for The Bowerman using three words and two emojis. We probably would have added a few more flames, but you get the point. There has never been a Watch List like this before in the 10-year history of The Bowerman, which is collegiate track & field’s highest honor. 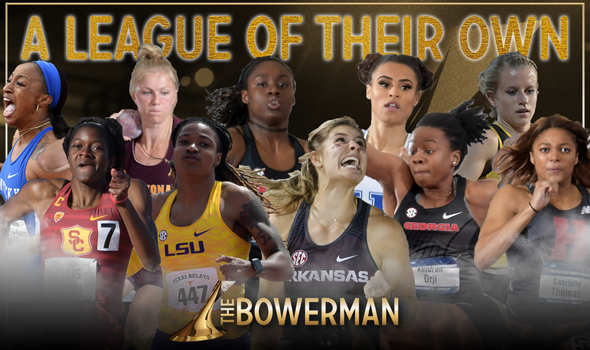 These 10 women – Kentucky’s Jasmine Camacho-Quinn and Sydney McLaughlin, Southern California’s Kendall Ellis, Arizona State’s Maggie Ewen, LSU’s Aleia Hobbs, Georgia’s Lynna Irby and Keturah Orji, Arkansas’ Lexi Jacobus, Missouri’s Karissa Schweizer and Harvard’s Gabby Thomas – are in an echelon of their own. Thinking about it, echelon might not be the correct term: It’s more like a stratosphere. It’s nearly impossible picking three finalists from this current crop. Camacho-Quinn, Ellis, Ewen, Hobbs, Irby, Jacobus, McLaughlin, Orji, Schweizer and Thomas have combined for nine individual collegiate records (Hobbs also has a relay record to her credit), two World U20 records (both by McLaughlin), one American record (Ellis in the indoor 400), eight individual NCAA titles and 43 all-time top-10 collegiate marks indoors and outdoors. That’s just what happened between the start of the indoor season and now. We’ll break down their credentials from only this year, because The Bowerman is a year-by-year award and has nothing to do with career accomplishments. Want to know the scary thing? There are still two meets to go! Next weekend these 10 women will compete in either the NCAA Division I East Preliminary Round in Tampa, Florida, or NCAA Division I West Preliminary Round in Sacramento, California. Then, if all goes according to plan, they’ll congregate in Eugene, Oregon, from June 6-9 to put on a clinic at the NCAA Division I Outdoor Track & Field Championships.